Joe Torre will be back as manager of the New York Yankees, finally getting the word from owner George Steinbrenner after the team's surprise elimination from the playoffs last weekend. Torre spoke with Steinbrenner on the telephone on Tuesday, shortly before he walked into the interview room at Yankee Stadium and made the announcement. "He gave me his support," Torre said. "I'm just pleased I'm able to stay on and do this." The two also spoke on Monday. "I talked to George yesterday for probably 15, 20 minutes, and we discussed a lot of things: the team, what we do from here and things like that," Torre said. Torre has the longest uninterrupted term for a Yankees manager since Casey Stengel held the job for 12 years from 1949-60. Under Torre, the Yankees have gone 1,079-699. He trails only Joe McCarthy (1,460) and Stengel (1,149) for victories among Yankees managers. With 1,973 regular-season wins, Torre is 10th on the career list and third among active managers behind Tony La Russa of the St. Louis Cardinals (2,297) and Bobby Cox (2,171) of the Atlanta Braves. But La Russa is still in the playoffs this year — playing the New York Mets, beginning Wednesday night, for the National League pennant — and Torre isn't. The Yankees' second straight first-round exit from the playoffs led to a swirl of rumors that Torre would be fired with a year left on his contract. "It's certainly disappointing," Torre said after the 8-3 loss and elimination in Detroit on Saturday. "Everyone in that locker room is disappointed." 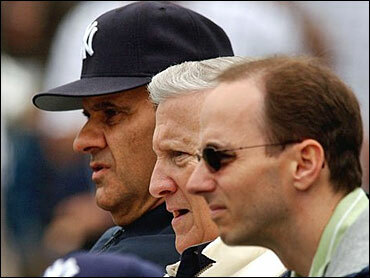 The Yankees have won the World Series four times under Torre, most recently in 2000. They had a record $200 million payroll this year and matched the Mets for the best record in the regular season (97-65). Detroit's payroll, by contrast, is less than half as much. Steinbrenner issued a statement Saturday that "this sad failure" was "absolutely not acceptable." Nearly half of the 10 highest-paid players in baseball — including the top three, Alex Rodriguez, Derek Jeter and Jason Giambi — wear pinstripes. The highest-paid Tiger, Magglio Ordonez, comes in at No. 10. But if Torre is staying, what about "A-Rod" — Rodriguez, who has disappointed Yankees fans? Torre kept moving him down in the lineup during the series with the Tigers, indicating he may have lost confidence in the third baseman. Rodriguez has also come in for his share of the blame, hitting 1-for-14 against the Tigers, and 2-for-15 against the Los Angeles Angels last year. Many fans and sportswriters say he should be among those sent packing from The Bronx. In Torre's 11 years as manager, the Yankees have won more than 60 percent of their regular-season games (1079-699 record). Torre posted his 1,000th win as Yankees manager this past season. The Yankees have made the playoffs in all 11 years that Torre has been their manager. They have won nine straight AL East titles. The 66-year-old Torre has one year and $7 million left on his contract. He is baseball's highest-paid manager. "I imagine you could blame a guy for making bad moves, but I don't know how you can blame a guy for the team going 20 innings in a row without scoring a run," former Yankees and Oakland Athletics star Reggie Jackson told The New York Times.